One of my favorite parts of motherhood is curling up with my daughter and a few good books. There is nothing quite like introducing books to your child – and it is never too early (or too late) to get started. Of the many, many parenting philosophies in this world, the only one that I steadfastly and wholeheartedly believe in is this: reading is the foundation of learning. There are other ways to learn, of course, but it is reading that will unlock the many doors of knowledge for Charlotte. And for better or for worse, knowledge is power. Reading takes time, effort, and practice, so we made the choice to start early. Several times a week, Charlotte and I go to a story-time at local libraries, museums, arboretums, or the homes of fellow mothers. And several times a day, I read to my baby. Maybe the dishes pile up and the laundry runs wild, but I would not trade our reading time for the world. A few weeks ago, I started sending e-mails to publishers of children’s books. I introduced myself and told them how much monthly traffic this website receives. I pointed out that many readers had expressed an interest in my family’s reading activities. I explained that I would love to use this blog to encourage pediatric literacy and to showcase good-quality children’s literature. I specifically requested books that I had not read or seen before. Within days, the boxes started arriving. One book here and another book there and three books off to the side. Some publishers stuck a few extra titles in for good measure. Donald, Charlotte, and I read them all. Front to back and back to front and upside down and right side up. And we fell in love with reading all over again. Beginning next week, I will use BecomingSarah.com to review – and giveaway – one children’s book every week. You will see pictures of our library adventures, our family trips to local bookshops, our story-times at home. 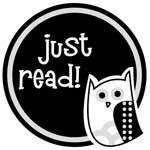 You will find links to literacy advocacy organizations and tips for encouraging young minds to fall in love with reading. The reviews will not be particularly formal, but they will be honest. You may not always read glowing reviews, but you will never read a negative one. The point is to show off GOOD books - if a story does not fit the bill, it is donated or returned to the publisher. One book a week is not much, but it’s a start. The goal here is to put more books in more homes. After all, most of you who read this have a child – yours or otherwise – in your life. It is up to all of us to reverse the trend of illiteracy, up to us to keep the libraries open and the pleasure of curling up with a good book in the forefront of those children’s minds. Maybe someday this website will be big enough for me to do more, but this is what I can do right now. Because my goal is to promote literacy and children’s literature, there are aspects of these reviews and giveaways that some of you may find tasteless. I will be directing you to the social networking pages, websites, and blogs of publishers, authors, illustrators, and literacy advocacy groups. To keep track of this, sometimes that means that I will be directing you to mine as well. I will be signing up with affiliate programs and encouraging you to use my website as a starting point for some of your book purchases. I will be designing buttons that you can place in your e-mail, on your blog, in your Etsy shop news page…in every color you could possibly want. I know that giveaway promotions often turn into shameless self-promotion, and nothing is more irritating than having to jump through twelve hoops to win a $10 book. I know this. I am asking you to jump through the hoops anyway, to publicize the reviews and giveaways however you can, to pester your twitter followers and your Facebook friends. If I wanted more website traffic, I would pay for advertising. If I wanted money, I would slap up some Walmart ads. What I want is to get as many people as possible - you and whoever you can muster - to get excited about reading to children. Period. So stay tuned and spread the word. In the meantime, tell me this: what are some of your favorite children’s books? (Remember, you do not have to be a parent to play along). What a wonderful way to utilize your website! Congratulations! I look forward to reading your reviews. Oh, my, I am just giddy reading this post! As an avid reader and early childhood educator, I ADORE books. They are everywhere in our house - we find them tucked in the couch cushions, on the bathroom counter, in kitchen cabinets, every diaper bag, and in the car pockets! We read every chance we get. I whole heartedly agree that the foundation of learning is reading. How do I choose just a few favorite books?! Some that my daughter has really enjoyed in her short six months are Hug (Jez Alborough), Kiss Good Night (Amy Hest), and all of the Oviier Dunrea books. I may be back with more favorites as the day goes on. I’m so excited thinking about books! Great idea Sarah! 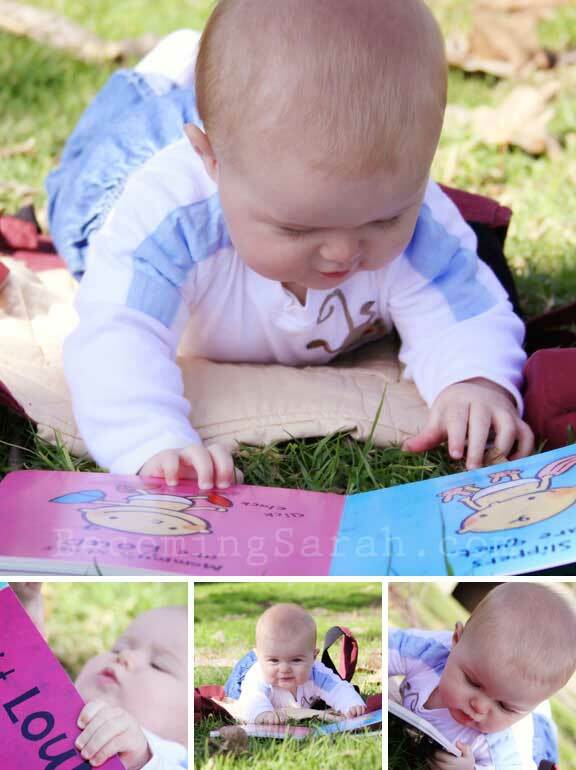 Reading is SO important for children and starting early will only benefit them later :) I loved the Berenstain Bears books as a child - and still love them now! Allie - OOH, I loved the Berenstein Bears too. Wow, I’d forgotten all about them! Heidi - I’d never seen the Olivier Dunrea books before I started doing this. It’s amazing how many cool books I’ve found in the last month! before Jude was born, I got the itch (and it was a really bad itch) to go out and buy buy buy! I’ve heard others call it nesting. I call it shopping. My husband did all but slap me up side my head every time I told him I wanted to go to babies r us. We hadn’t had our shower yet, so he totally disagreed with me buying anything until the shower was all said and done. I sulked… and sulked some more and then found a loop hole. We’d skip BRU and instead go to Borders (or any other book stores). I would spend at least an hour at a time filtering through the children’s books to find the ones I remember reading as a child. My husband built shelves, we got a hand-me-down rocking chair from my grandmother and thus our “reading corner” was set up in Jude’s room. It’s by far one of my favorite places in the house. I’d say my favorite book is The Lorax. I’m pretty sure I’ve read it to Jude a million and a half times and could read it backwards and forwards from memory. Another recent favorite was “On the Day you Were Born”. Love it. I don’t think there is anything distasteful about promoting reading! I don’t know how old you want to go, but in the future, or if anyone has boys who don’t like reading; Gordon Korman has the funniest books with boy protagonists. Parents can get a kick out of reading this (Canadian) author to their kids too. Good to start reading with/to children as young as 8 or 9 I’d say. I’m sure I’ll think of more but that’s all for me so far! And I’ll gladly jump through hoops, if it gets more families reading. My daughter, at ten months old, will already flip through books on her own. That makes me feel all warm and fuzzy - I must be doing something right! Amber - I cannot WAIT for that moment. At 7 months, Charlotte likes to hold a book, turn it around in her hands and babble at it. I should really break out the video because it just makes my heart sing. When she starts flipping pages, my heart might explode! What a great idea! I love this idea and my sister would be peeing her pants if she read blogs. She’s a preschool teacher and has filled my house with books for the baby because she fundamentally believes that it’s the best thing you can do for a child’s development and learning. Sounds like you agree. Anyway, I think this is awesome and can’t wait to see what books you promote. Krista - Tell your sister to check it out! Seriously, spread the word! The more traffic we get here, the more we can do with this in the future! I love books and reading to my children is my favorite time of the day. My six year old son now reads to me at night and I can’t tell you how proud he is when he finishes a story. In fact, yesterday I took him to get his very own library card. He was busting at the seams. Our favorite books have always been the Pigeon series by Mo Willems. They are so funny and full of energy. I now read these same books to my five month old daughter who laughs when I change my voice in exasperation as the pigeon carrries on. Our other favorite book is You Are My I Love You by Maryann K. Cusimano. This book brings tears to my eyes some nights when I read it to my babies. Yay, Yay, Yay!! As an English teacher and a mother this makes me beam! I wish all mothers and fathers stressed a love of reading- our country would truly benefit. “Someday” makes me cry every time. It’s truly a mother to child book- you’d LOVE it. I also am a huge fan of Olivia books- great red colors and great writing, too. I saw someone mention On the Day You Were Born- it is GORGEOUS. My 3 almost 4 yr old son’s current favorite is “Chugga Chugga Choo Choo” and I also love it. Such an imaginative story! He also loves the Byron Barton books—his current fave is Dinosaurs, Dinosaurs. The book Charlotte is reading in the above photos is an old favorite. :-) I recognized it immediately! I don’t know if all libraries do this, but ours has a program where you bring your baby in before 3 months and they get a tote bag and free book—and when you bring them back, they get another one! I’ve participated in that with both kids. Our library also has a play area, which we frequent. Our librarian knows us by name! I work in the children’s department of a bookstore and have been slowly amassing books for our unborn baby, due this summer. I have a background in illustration, so my favorite books have a great story and great pictures to match. I love “Fairytales” by ee cummings, almost everything by Eric Carle or by Martin and illustrated by Carle, Shel Silverstein is near and dear to my heart, and I love Dr. Seuss, especially “If I Ran the Zoo”. Those are the books from my childhood I hope to share with my daughter/son. Some of the more recently published books I love are “Elmer” by David McKee, all of the pigeon series by Mo Willems, and “Skippyjon Jones” by Judy Schachner. This post makes me so happy. My husband and I are both avid readers and want nothing more than to pass this on to our child from day one. Um…yeah I forgot to add that I am super excited about this news too!! Can’t wait to see it all unfold! Such a great idea, thanks for doing it! My kids are wild for Skippyjon Jones. My husband reads them aloud using wild accents and sound effects. Even my big kids come running when Skippyjon appears. I like old Richard Scarry books, the Frog and Toad series (hysterical), Madeline books, all the Olivias (she reminded me so much of my firstborn when they first came out). Seuss’ My Many Colored Days is fantastic and always a favorite, along with What Was I Scared Of? They are lesser-known, but excellent. I could go on and on. I took 2 semesters of children’s lit. when I was in college. I started my children’s book collection long before I had kids…long before I met my husband, too! I love the way you are handling these giveaways. Ooh, Sara, if you love Shel Silverstein, check out: My Hippo has the Hiccups, by Kenn Nesbitt. I read those poems to Charlotte constantly! Hollie - Our library does not have a program like that =( I’ve been thinking about asking a few local libraries to help promote the giveaway thing after story times, though. Seriously, any way to increase the traffic to the giveaways will only help keep the giveaways going in the future and (eventually) bring more revenue in for pediatric literacy programs and organizations. People ask me all the time how my (now two-year-old) daughter learned to speak so well, and knew all her letters by the time she was 18 months old. “Did you have to work with her a lot?“ they ask. “I read to her,“ I say. She loves reading books, and if she catches anyone with a free lap, she’ll plop herself right down on it with a story that she fully expects to be read to her promptly. She has a lot of her books memorized and will “read” them to herself sometimes. I have no doubt she will be reading for real by the time she is 3. And I think she will do it without any real pushing by her parents. Some of our favorites: Goodnight Moon; Mama, Do You Love Me? (the very first story I read her - she was still in-utero at the time); Love You Forever; All Sandra Boynton’s board books; Peef the Christmas Bear (beautiful illustrations); and The Flopsy Bunnies. I LOVE Tiger Flower by Robert Vavra (illustrated by Fleur Cowles). It encourages thinking outside the box, and since the book was actually written around the illustrations, it is a very rich visual experience. Jude gets so excited when we read it…pats the pictures, strokes the tigers and flails his arms around like a maniac. I made the mistake of reading it to him before bed once. He did not sleep until past midnight…LOL. It is out of print now…probably has been since before you were even born, Sarah, but oooooh…it’s delicious. When I was pregnant with my son Nolan, I came across a poem that I decided would be my mantra from mothering. In your post you said “ Maybe the dishes pile up and the laundry runs wild, but I would not trade our reading time for the world.“ Maybe you’ve come across it in your travels, but this poem sums things up perfectly! I’ve enjoyed following your blog and can relate to so many of your posts, as my son is 4 months old. I’m a high school English teacher and I whole heartedly support with your goal to promote literacy. Keep doing what you are doing! You are a great mom! My husband and I are expecting our first child and have already started reading to him/her in utero. I am a teacher, so this post excites me to no end! My favorite children’s books are Corduroy, Goodnight Moon and books that raise early awareness to colors, shapes, letters, numbers. Thank you for doing this on your website! First, I love your blog and read daily, but this is my first time commenting! I love this idea - what a wonderful thing for you to do! And I have a question…have you ever heard of Dolly Parton’s Imagination Library? It was started by Dolly Parton and the Dollywood Foundation. The program provides free, age-appropriate books to children ages birth through their fifth birthday. The children receive the books at their home mailing address once per month. Each child has the potential to receive 60 books before their fifth birthday. You might want to check the national website to see if it’s available in your area! It is not based on socio-economic status, it is truly a program for ALL children! I actually work for this program in West Virginia. I love seeing/hearing about other young adults who realize how important reading is! Congratulations and good luck on this journey! As a new mom-to-be, reading has been at the front of a lot of this process. I read pregnancy books, sure, but I often end up reading children’s books. My first order of business was setting up the amazon registry with lots and lots of books I wanted for the baby. My favorites? Pat the Bunny, The Very Hungry Caterpillar, ANYTHING Dr. Seuss, and all of the Bernstein Bear books. This is a great idea and I look forward to tuning in! We’ve read them so often that even though they’re board books, they are in quite poor condition. However, we’ve also memorized them from reading them so often, so we don’t much care. Oh books. We have have been reading them since before my now 3.5 yr old son was born. We read to my stomach as soon as we read that my son could hear. We read no less than two books every night before bed. Usually it is more like five or six. In the morning, we read. On the weekends we spend countless minutes reading books. There are books everywhere in the house (even some waterproof books in the bathroom!) and all at toddler level. Our favorites recently are Sandra Boynton books. But Not The Hippopataumus, Hippos Go Berserk, The Going to Bed Book. We also love Usborne touch and feel books. Sure we are out of the “touch and feel” stage but Maddox still loves them. Dr. Suess is fun. Mr. Brown Can Moo and Cooking with the Cat are huge hits. I don’t know what we would do without reading. We don’t have cable (by choice) and reading is one of our favorite ways to bide our time. Opps that should be 2.5 years old. Oh and Shel Silverstein and Eric Carle are some other favs. We bought him the 13 book collection “A Series of Unfortunate Events by Lemony Snicket” before he was born. I’m just waiting until he’s old enough to read them. As an expecting mother I love reading to my daughter and I think this is a great idea! My faves have always been anything Dr. Suess (yes I know he was insane) and I also love the Berenstein Bears. And I was reading by myself by the time I was 3! Oh, and for the younger board-book loving set, I love Bear Wants More and Bear Snores On and Bear’s New Friend. I forgot to mention that the public health nurses here give packages of info on their first visit…usually the day after you bring the baby home. In this package is a book to read to your baby, a toothbrush (Jude’s is pink…hehe), a gum brush, nose drops, and countless booklets full of useful info. The thing I was most impressed with? The book. I am extremely happy that the health system here is 110% behind literacy. The nose drops were useful, too…lol. What a fantastic thing you are doing! I love how your blog is changing and growing, just like Charlotte! I have all my girls books from when they were tiny. They have such good memories of us reading to them every night. My youngest daughter wants to illustrate childrens books. Awesome! Awesome! I love that you’re taking your blog and turning it into a vessel to make our world a better place. That is amazing! For work I’m helping organize a book drive this summer. The books will be going to kids—most of whom don’t have a single children’s book in their house. I was saddened when I heard that, as one of the things I remember most from childhood is my mom reading books to me. Reading books with my mom—cuddled in her lap (I would cuddle in her lap until I had long grown too big! )—anyway I always felt safe, secure and LOVED when my mom and dad would read to me. One of my favorites was the Boxcar Children series. Granted Charlotte is a little young for that book, but it’s still a great children’s adventure book. I also just read through all the comments to get ideas on how to use my daughter’s amazon gift card from Christmas! Sarah, this is awesome!! I was raised with oodles of books from an early age and read voraciously all through my youth. When my friends were still reading Babysitter’s Club books, I was reading novels like Les Miserables. I chalk it up to parents who believe just as you do. Now that I’m pregnant with my first, I’m especially excited to see you doing something like this. It’s such a worthwhile cause, and I’m all for it. What a great idea Sarah - and I doubt the “giveaway self-promo” aspect will be an issue since you’re doing this for something we can hopefully all get behind - BOOKS. No surprise here, one of my favorite books growing up was Eloise - I read it to my Eloise - not all in one go - she’s not quite there yet - but tonight she laughed while I read a few pages to her and I almost swallowed her whole I was so proud. I’ve also been happy to find UK books that I never knew about - the Hairy Maclary series is great for first books. As a small child, I loved, loved _The Pokey Little Puppy_. Still do, actually, because I loved the rhythm of it. GREAT addition, absolutely LOVE this. We’ve been reading to Finnegan every day since he was born. Even when he couldn’t comprehend, now he still is a voracious reader asking for probably 20 stories a day. It is something thast is important in our household &I’m glad you’re using your blog to get the message out to other parents that reading is important. So, on to our favorites…. He is also loving the toddler board versions of I Spy books now where they have easy items to search for on the pages. We have many favorites in this house but the ones I have gone back to for each baby are the John Bulter books and the pictures are gorgeous! Whose Baby Am I?, Who Says Woof?, If You See A Kitten, Whose Nose and Toes…..and I incorporate sign language by teaching the animal signs! My boys know them so well my six yr old now reads them to the baby! Love me / us some books!! I love anything by Dr. Seuss… My favourite is Oh The Places You’ll Go! I also LOVE, LOVE, LOVE, LOVE, LOVE, LOVE, LOVE, LOVE, LOVE, LOVE (!!!!!!!!!!!!) Robert Munsch. Get the book Love You Forever… You will bawl. I’m almost crying just thinking about it. I love this idea. I don’t have kids yet, but I will stress the importance of reading when I do. My favorite children’s book is We’re Going on a Bear Hunt. So good. Sarah, you should WRITE a children’s book!!! This is an absolutely wonderful idea! And crazy timing too! Last night in our final birthing class a woman from our local library came in to talk about the importance of reading to children starting the day they’re born. There are far too many people out there who never hear the spectacular benefits of doing this! Although my due date is still (technically) 7 weeks away, I have been reading aloud to Harper. Right now it is the Secret Garden. I’m a sucker for the classics, even though this isn’t a book meant for small children. I tend to read aloud the books I’m currently reading to her. We have amassed quite a bit of children’s literature since both of our parents kept all of our old books! I’ll have to look through them to come up with some of our favorites! I ran across your blog from tysonandjulia.com and have been following you for about 2 years now. You. crack. me.. up! I look forward to your posts every day. I am an elementary school teacher and I cannot tell you how many children cannot read; it breaks my heart. I am a huge advocate for good quality children literature (not the crap you pick up at the grocery stores such as Golden Books), but good stuff like Dr. Suess or Eric Carle. Reading is extremely important. I feel literacy is something you will always have that cannot be taken away. So keep on reading, Sarah! I love your motivation! As a teacher, you make me proud!!! Also, I think it is great you contacted children’s publishers. Good luck to you!! How great! I believe reading is the one essential part of our children’s education that cannot be compromised. I did a review on a book that may interest you…here’s the link. Sorry, but you’ll need to scroll past the latest review. The book is ‘What to Read When’ by Pam Allyn, a literacy advocate. It would probably be a help to you. I’m very excited about this new venture! I’m pregnant with my first and I just started reading to my belly. My husband and I are both avid readers, but we are unfamiliar with children’s authors so I can’t wait to see what you suggest. I have all of my Bernstein Bear books from when I was young so I have started reading those. My husband also has a few Munch Bunch book from his childhood. Looking forward to starting this up next week - it’s such a great idea!!!! charlotte is absolutely, fantastically gorgeous. got your email and responded already. this sounds incredible. Love this idea! We read books no-stop here. My 15-month-old daughter’s favorite books are the DK Peekaboo books, anything Roger Priddy (B is for Bear, Alien Al, Chirpy Chick, Millie Moo, First 100 Words) Noisy Farm (DK), all Sandra Boynton (especially Belly Button Book and Snuggle Puppy), and the Than’s Not My….. books (That’s Not my Monkey, That’s Not my Puppy). I can’t wait to try some non-board books, but Kate isn’t quite ready yet- she is a boisterous reader!! I am avoiding doing work so here are some more books! my mom read to me every night before bed and books of all sorts. jane eyre was (and still is) her favorite so i heard that one a few times. one of my favorite books was “The Fourteen Bears in Summer and Winter” (it was a deluxe golden book) which now ranges from 20- upwards of $600 dollars depending on the condition!! holy holy holy!i only know because i googled it to buy for a friend of mine because i could not find it anywhere! and now i know why!! i am the proud owner of a very used copy in which the white bear in a pink tutu is circled on every page (that was ME on that page and i wanted you to KNOW it) and my initials were scrawled in several areas (toddler graffiti?). my copy would probably not make the list of $20 copies. but i have quite a few of those sorts of books that I love that i LOVED so much i had to tag it. mine. KBF. mine mine mine. a newer book that is fun is “Mooses Come Walking” -an arlo guthrie song illustrated. and the one i still have memorized: “One Fish Two Fish”. i love love love that Dr. Seuss. and i too was reading before kindergarten! all because of my mommy! Lovely idea, Sarah. I wonder if you are going to be able to find decent, well-written children’s books that don’t have “bodily-function humor” (as I call it) in them? I was so disappointed by the newer books (when my son was younger) that I didn’t buy modern stories. The classics are the best. “Pat the Bunny” “Good-Night, Moon” “The Velveteen Rabbitt”—etc. etc. If you give a mouse a cookie (or any of the alternatives). I’ve just taken over a site where I live and I’ve got some great ideas about where it can go - book reviews and giveaways is one thing I can’t wait to get into. Nice work! I love the books Make Way for Ducklings & Blueberries for Sal by Robert McCloskey! FANTASTIC way to use this bog - I agree with your take on the vital importance of reading, and its relationship with future power. Good work, you. “On the Night You Were Born” by Nancy Tillman. Awesome book. Books are very dearly loved and enjoyed by me and my daughter. Some of our current favorites are by Julia Donaldson: The Gruffalo, The Gruffalo’s Child, The Snail and the Whale, and Charlie Cook’s Favorite Book to name a few. Thanks for putting together such a great program to inspire us all! Wow, that’s fantastic, way to go! We love to read to our 9 month old. We have too many favorites to name, but some new ones I’ve just discovered are Little Pea, Little Hoot, and Little Oink by Amy Krouse Rosenthal and Jen Corace. The are just adorable. Right now board books are definitely in since she likes to chew on them, and I Love You Through and Through is one she will listen to me read over and over. New favorite: And Tango Makes Three. Sarah this is awesome! We read to Lily everyday and we love it. For right now our favorite book is Doggies by Sandra Boynton. While this isn’t her best book by far (I think Moo, Baa, La la la probably is) this is Lily favorite. Each page has a dog on it and a dog sound. I think Lily really likes to make me bark over and over again. As a grandma and a retired 1st/2nd grade teacher, I am thrilled that you are focusing on reading. So many wonderful books…so little time. Too many books to mention! I could go on forever, but those are some books that have made a big impact on our family. I picked up I Love You Stinky Face one day in a store merely because it had a fun cover; and within the time it took me to flip through 3 random pages, it made me cry. That, to me, is a great book. What a wonderful idea! As a former teacher, and ravenous reader myself, I love this! My son is two…his favorite books right now are anything with photographs of cars/trucks/trains/planes/etc. But I still manage to sneak in some real books, too. He loves “The Five Little Monkeys Jumping on a Bed,“ “Goodnight Moon,“ and anything by Sandra Boynton. And I’ve got bins & boxes of preschool- and school-aged books waiting patiently up in our attic for him as he gets older. I’m hoping he winds up loving Dr. Seuss just as much as I do! My Charlotte loves The Cat in The Hat. I have read it to her every night since she was but a wee few weeks old. Now I have it memorized and I just recite it to her in the dark as I nurse her to sleep. So The Cat in The Hat is our favorite. Daddy has started reading her Kiss Goodnight at bedtime too. What a fantastic idea! My absolute favorite parts of the day are when my two children and I are on the couch, chair, bed reading! My favorites growing up are (in no particular order): The BFG, Matilda, Charlie and the Chocolate Factory, Green Eggs and Ham, The Babysitters Club Series, Little Women, The Boxcar Children Series, and those Choose Your Own Adventures (even though technically you never read the whole thing. But I like choosing my own destiny!). Next entry: Behind the Blog: Elizabeth, Elizabeth, Elizabeth. Previous entry: My sleeping beauty.